A recording of sixteenth- and seventeenth-century keyboard music performed on a reconstruction of the clavichord described in Marin Mersenne’s Harmonie Universelle (1636)made by Peter Bavington. "Its genuinely delightful to hear a 400-year-old instrument resurrected from a drawing." Andrew McGregor, 'CD Review', BBC Radio 3, 28 November 2015. Music Web RECORDING OF THE MONTH December 2015 "This is a unique recording in that for the first time we hear a clavichord in French keyboard music. 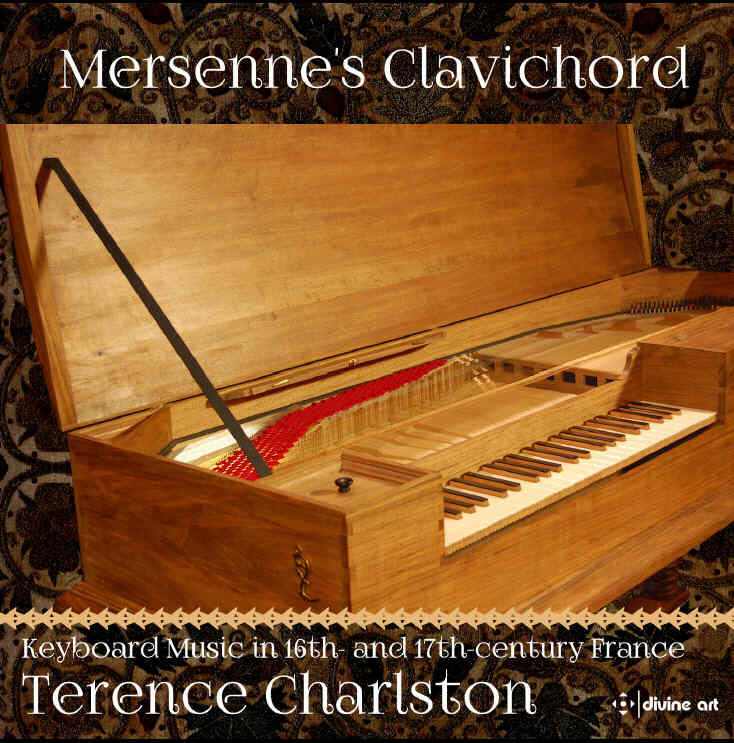 It is also a groundbreaking recording, not only because of the first attempt to reconstruct a French clavichord as described by Mersenne but also because of the possible impact on the approach to French harpsichord music in general. Terence Charlston deserves much praise for his initiative … Charlston once again proves to be a very stylish and sensitive interpreter. His performances here are simply superb. … Ample reasons to label this disc Recording of the Month." Johan van Veen http://www.musicweb-international.com/classrev/2015/Dec/Mersenne_DDA25134.htm . More at ‘Mersenne’s Clavichord’, Divine Art DDA 25134. You can hear some of this repertoire played on the organ in Westminster Abbey by clicking here. Reconstruction from Mersenne’s isometric plan of the manichordion. 49 notes, C–c3 without a short octave, unusual design with 5 high bridges and long tangents. a) The engraving of a manichordion in Harmonie Universelle (Liure Troisiesme des Instrumens, p. 115). b) Reconstruction by Peter Bavington. La Magdalena P.D. [Pierre Blondeau? (fl Paris, 1st half of the 16th century)] Dix huit basses dances … en tablature du Lutz, 1529, p. i. La brunette & La shy myze Anon. GB-Lbl Add. MS 30513 (Mulliner Book), ff. 16v & and 17. Moneghina Gagliarda & Gamba Gagliarda Antoine Gardane [Gardano] (b southern France, 1509; d Venice, 28 Oct 1569). Fantasie Charles Racquet (b Paris, 1597; d Paris, 1 Jan 1664). Mersenne, 1636. MS insert. ‘Tu crois, ô Beau Soleil’ Pierre [iii] de la Barre (b Paris, bap. 27 Jan 1592; d Paris, bur. 31 March 1656). Mersenne, 1636. RAM 1637 copy. 2 pieces: Prelude - Volta Mercure d'Orléans (fl c1590–c1619) D-Hs, Ms. 3238 (now M B/2768), p.4 and G.L. Fuhrmann, Testudo Gallo-Germanica, Nuremburg, 1615, p.177. Duo Mr. Couperin F-Pn Rés.Vm7 674–5 (Bauyn II), 59v-60v. Prelude Jean Henry D’Anglebert (bap. Bar-le-Duc, 1 April 1629; d Paris, 23 April 1691). F-Pn Rés. 89ter, ff. 52v-55r. This recording is part of a broader project to explore sixteenth- and seventeenth-century French keyboard music through the touch and sound of the clavichord. Modern players and makers have tended to attach little importance to the rôle of the clavichord in the development of French keyboard music. This is for two main reasons. Firstly, we lack original instruments to play and copy since no clavichords of incontrovertible French origin survive. Secondly, the era of the clavichord’s greatest popularity in France, the sixteenth century, overlaps with a lacuna of nearly 150 years from which practically no printed or manuscript keyboard music remains. Nonetheless the clavichord was highly valued within late-renaissance culture and continued to be used by musicians into the seventeenth century and later. At least forty-one professional musicians between 1557 and 1793 possessed one or more clavichords (including Armand L. Couperin in the year of revolution, 1789) and some famous harpsichord makers (for example, Henri Hemsch) had clavichords in their workshops. Like the lute, the clavichord’s intimate and expressive voice must have enjoyed a favoured status in aristocratic and learned circles. The clavichord was known in France from at least the fifteenth century. It is described and illustrated in the treatise of Henri Arnaut de Zwolle (astronomer and physician to Philip the Good, Duke of Burgundy, and later in Paris to Charles VII and Louis XI), which dates from the 1440s. Literary sources also attest to the fashion for the clavichord at court. The word for clavichord, manicordion, entered popular speech, for example, as in the expression ‘Elle a joué du manicordion’ which implied that a young girl had a lover. The clavichord’s popularity was at its height in France in the sixteenth century. Nicolas Bontemps was building clavichords in Lyons between 1506 and 1516 and the publishers Attaingnant and Gardane cite the clavichord amongst the instruments suitable for the performance of their keyboard prints. The clavichord is shown accompanying the recorder in a Gobelin tapestry and Jacques Cellier, organist of Rheims Cathedral, noted the identical case structure of the épinette (a rectangular virginals, here translated as ‘spinet’) and the clavichord (c. 1587). Clavichords were present in the workshops of Yves Mesnager (1556) and Claude and Robert Denis (1587 and 1589), and in musicians houses, for example, Nicolas Robillard (1557). The Parisian organist, Guillaume Raguenet, is recorded in the Minutier central of 1557 as contracted to give lessons on the spinet and clavichord. The court musicians, particularly the specialist joueurs d'épinette such as Pierre and Jean Dugué, and Thomas Champion, must surely have played both clavichord and spinet. In the early seventeenth century, clavichords are mentioned in many official inventories. These include evidence of clavichord related trade with Spain (1606 and 1628), and clavichords within the estates of the instrument makers, Jean Jacquet (1632), Jean Denis (1672) and Pierre Baillon (1682), and eight musicians including Pierre Chabanceau (1600), Nicolas Gigault (1662) and Henri Dumont (1684). Pierre Trichet, in his Traité des instruments de Musique (c. 1640) notes its usefulness to train the hand in ‘suppleness on the harpsichord, spinet or the organ’ (1640). Trichet also states his preference for the word clavichordium to designate ‘clavichord’ rather than manichordion which can be mistaken for another instrument, the monochord. Clavichordium can mean any keyboard instrument or more specifically a harpsichord, however, so rather than clarifying the matter, Trichet serves to underline the inherent problems of musical instrument terminology in historical documents. The lack of a single surviving French clavichord makes the detailed description and plans in Marin Mersenne’s Harmonie Universelle, published in Paris 1636 or 1637 all the more significant and tantalising. Marin Mersenne (1588–1648), theologian, philosopher and mathematician, was fascinated by music and sound. He corresponded widely to assemble the material for his monumental musical encyclopedia, Harmonie Universelle, and took great pains to get it printed. In the fourth part, the Traité des Instrumens, he includes, amongst descriptions of other more familiar stringed keyboard instruments including the virginal (épinette), and the harpsichord, a detailed account and illustration of the clavichord. Although no clavichord sharing Mersenne’s unusual design has survived, there is no reason to doubt that such instruments existed or that Mersenne had first-hand experience of them. Mersenne’s illustration has been shown to be isometric and the exact proportions he gives have enabled the British clavichord maker, Peter Bavington, to build a working example. Playing this meticulous and very musical reconstruction inspired my search to understand how such an instrument might have been used and what music might have been played upon it. It has a distinctive and attractive sound, similar in many ways to the lute or guitar, and is an elegant vehicle for all styles of keyboard music current at the turn of the sixteenth century and later. Finding appropriate repertoire for the Mersenne clavichord is not quite as simple as it might seem. Very little French keyboard music survives from the period after the seven printed keyboard books published by Pierre Attaingnant (c. 1494–1551/2) in 1531 and before the relative wealth of surviving late seventeenth-century manuscript and printed volumes. Exceptions to this dearth of printed material include the two volumes of organ music by Jehan Titelouze (1623 and 1624), Fugues et caprices by François Roberday (1660), and a few keyboard versions of ensemble pieces by Henry Du Mont (1652 and 1657). All seven of Attaingnant's seven keyboard publications include the clavichord in their titles, ‘en la tablature du ieu Orgues, Espinettes et Manichordions’ for example, but no later sixteenth-century publication specifies clavichord performance. Keyboard players of the time did not limit themselves, however, to playing just one type of keyboard instrument but rather realised their musical ideas, often improvised, on any one of the many different types available to them. These included the harpsichord family (plucked strings), organs (both in church and in secular spaces) and the clavichord. Generic keyboard music (i.e. specific to a certain instrumental tradition, e.g. organ or harpsichord) can also be performed on instruments other than the one seemingly intended. Throwing their net ever wider, keyboard players were arranging non-keyboard music. Vocal intabulations (motets, chansons), instrumental counterpoint and dances, and lute music in general, were fair game for any keyboard instrument, not least the clavichord. A vast range and number of pieces (running to many hours of music) were considered for inclusion in this recording, and these have been reduced to a handful of representative items. The recording is divided into three main historical periods, the sixteenth century, the early seventeenth century and the later seventeenth century. This chronological progression is interleaved with different genres and styles. Lute music translates well to the clear speech, refined sonority and subtle dynamic nuance of the clavichord. As David Ledbetter has comprehensively shown, the sound and technique of the lute style was fundamental to the evolution of the mature French harpsichord style. One very important outcome of this project and recording is the demonstration of how well the earlier keyboard music sounds performed on the clavichord, suggesting an earlier evolution of the clavecinistes touch and repertoire in which the clavichord played a significant part located somewhere between lute and spinet. The design of the Mersenne clavichord has a direct impact on its touch and sound. Its full, chromatic compass suits the majority of the repertoire and its light key action, with long keys and tangents, is not dissimilar to a lightly voiced Franco/Flemish harpsichord. The sound is greatly affected by the five bridges, each of which has a distinctive sound with the difference between bridges most pronounced where one ends and another begins. Thus the instrument can be said to have (at least) four registers or characters, approximately corresponding to the vocal ranges, treble, alto, tenor and bass. These characteristics are distinctive from other contemporary clavichords and set considerable technical and interpretational challenges for the player to overcome. Bernard Brauchli, The Clavichord (Cambridge: Cambridge University Press, 1998). Barry Cooper, ‘A New Source (c. 1600) of Chansons and Keyboard Music’, Recherches sur la musique française classique, Vol. 20, 5–17. Bruce Gustafson, French Harpsichord Music of the 17th Century: A Thematic Catalog of the Sources with Commentary, (Ann Arbor MI: University Microfoilms International, 1977, 1979). David Fuller, 'Fifty-Two Fugues from 1618, An Essay on Genre' in Fiori Musicali: Liber amicorum Alexander Silbiger, edited by Claire Fontijn and Susan Parisi (Detroit: Harmonie Park Press, 2010). Bruce Gustafson and David Fuller, A catalogue of French Harpsichord Music 1699-1780 (Oxford: Oxford University Press, 1990), 384–86, 399–400. Daniel Heartz, Pierre Attaingnant, Royal Printer of Music: A Historical Study and Bibliographical Catalogue (London: University of California Press, 1969). David Ledbetter, Harpsichord and Lute Music in 17th-Century France (London: Macmillan, 1987 and Bloomington, IN: Indiana University Press, 1988). David Ledbetter, ‘German and Swedish Arrangements of Seventeenth-Century French Lute Music: a Repertoire for Fretted Clavichord?’ De Clavicordio VII: The Clavichord and the Lute, ed. B. Brauchli, A. Galazzo, J.Wardman (Magnano: The International Centre for Clavichord Studies, 2006). 63–80. François Lesure, ‘La facture instrumental a Paris au seizieme siecle’, The Galpin Society Journal Vol. 7 (1954), 25, 30-31. Francis Knights, ‘Some Observations on the Clavichord in France.’ The Galpin Society Journal, Vol. 44, (1991), 71–76. Guy Oldham, ‘Louis Couperin: A New Source of French Keyboard Music of the Mid-17th Century’, Recherches sur la musique française classique, Vol. I (1960), 51-59. Roger Williams, ‘A Copy of Arcadelt Madrigals with Manuscript Additions’, The Library and archive collections of the University of Aberdeen : an introduction and description, edited by Iain Beavan, Peter Davidson and Jane Stevenson (Manchester: Manchester University Press with the University of Aberdeen, 2011), 24–25. Jonathan Wohlers, ‘The Fugues of British Library Additional Manuscript 29486: A Transcription of Folios 54–81 with Commentary’ Doctoral Thesis, University of Houston (Houston: University of Houston, 2008).